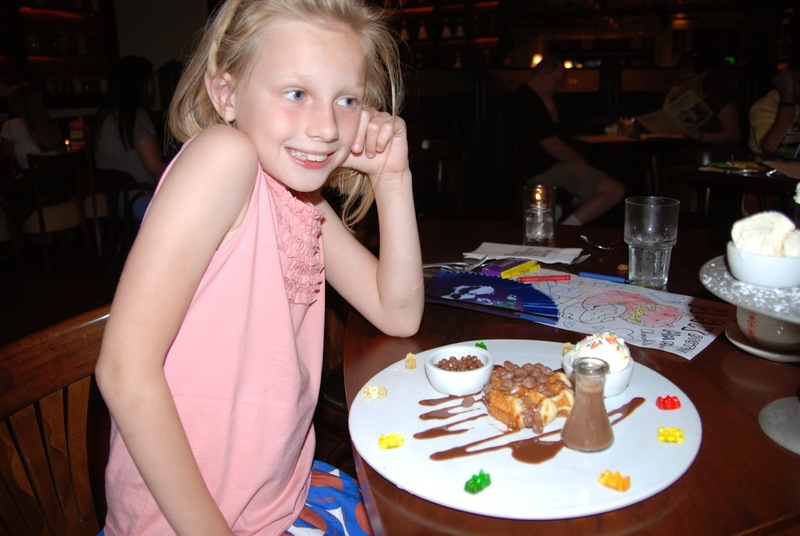 When I was on holiday in Boston, USA me and my family went for dinner at Max Brenner. From the moment I stepped in I knew this'd be a unique meal and I was right. Everything was CHOCOLATE!! which by the way is my favourite food in the whole universe. There were jars of chocolates, sprinkles and sweets lined neatly on shelves and tubes which carried melted chocolate ran everywhere including right above our heads. When we were handed our menus I gasped (in delight). Everything looked DE-LIC-IOUS!!!! - especially the desserts. But sadly it wasn't dessert time. Yet. After I finished my scrummy meal of chicken nuggets sprinkled with coco dust and fries it was time for the puddings. YIPPEEEEE!!!!!! 2 Strawberries - to try and keep me healthy. I really enjoyed my experience at Max Brenner, it was so nice to go into restaurant that was different to all the others. Also the food was SUPER-delicious, this restaurant does stick in my head now as a favourite restaurant. I'd so recommend it to anyone who happens to live or visit Boston, USA because we had a really nice time and me and my family would definitely go again.